Air-Port® cushion footbed circulates air with every step. Pro-Cell comfort system features a soft polyurethane footbed with in integrated energy return heel plug, a cushion insole, non-metallic shank, midsole and the Pro-Cell rubber outsole. Rocky work boots and shoes are available with protective toe caps that meet or exceed ASTM F2413 standards as well as CSA Grade 1 standards. If you or your employees are in need of a work boot with a safety toe, Rocky offers the following options. STEEL TOE BOOTS AND SHOES: Provides the highest level of protection against workplace accidents and hazards and is typically recommended for jobs that require top-level protection. If you have a value-fitted CustomFit website log in and check out our selection of both Rocky men’s steel toe boots and shoes and women’s steel toe boots and shoes. COMPOSITE TOE BOOTS AND SHOES: This type of footwear also provides excellent protection against workplace hazards and accidents, but since they are not metal, they are lighter in weight than steel toe caps and pass through metal detectors without problems making them a good choice for workers in the Transportation and Correctional industries. CARBON FIBER TOE BOOTS: As strong as steel but 50 percent lighter than steel, the carbon fiber toe cap is non-conductive and resists extreme heat and cold. Depending on your job or workplace requirements, there are numerous protective features that you might need or require your employees to have in their work boots. 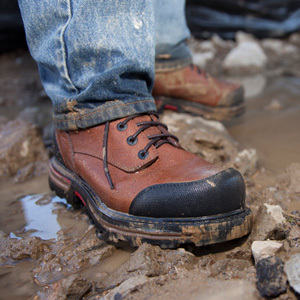 WATERPROOF BOOTS: To keep feet dry while you work, Rocky manufactures a variety of waterproof boots using either their proprietary Rocky Waterproof Construction or the guaranteed waterproof and breathable GORE-TEX fabric. Just as valuable as protection is comfort - especially when the job requires all-day standing, walking, climbing and moving. Built with quality materials to ensure superior performance, Rocky demonstrates its decision to providing a product you can depend on to keep you both safe and comfortable in any work environment. High-end footbed technology is at the core of footwear comfort and Rocky's proprietary and exclusive Air-Port Cushion footbed, Energy Bed, and Terra Suspension footbed are comparable to none. To learn more about whether Rocky is the right boot for your job, contact one of our Fit Specialists Today. Don't have a CustomFit account yet? Get Started on saving substantial money and time with the best selection of styles of top-name industry brand safety footwear like Rocky Shoes and Boots.